Your first destination of the visit to Myanmar will be Yangon and it is a fantastic starting point. 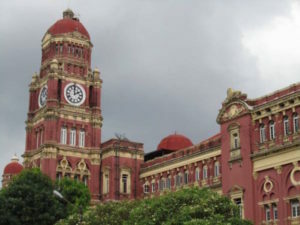 Yangon is the former capital of Myanmar and it is known to be the most developed city in the country. Yangon is the main tourist attraction of Myanmar and filled with amazing things to do in the city. The city is a perfect city for the people who like to explore cultural treasures. The city can satisfy the people who seek for fun and excitement. When planning a trip to Myanmar, this guide will be able to fill your itinerary for the most exciting trip. Yangon is the busiest city of Myanmar and there are many exciting things to do in the city. The city has a lot of tourist attractions including pagodas, parks, colonial buildings and many more. 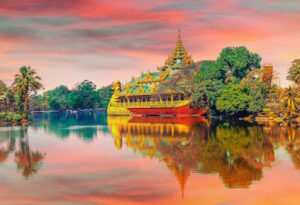 Depending on how many days you are spending in Yangon, the travel itinerary should be carefully planned. 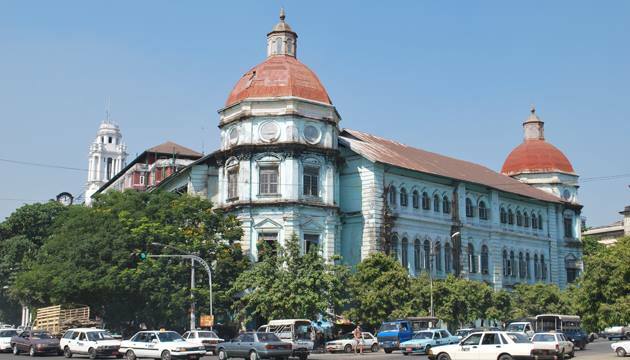 If you are seeking for a useful guideline, here is our list of Yangon places of Interest. Let’s start with sightseeing places before going into the dark side. Myanmar is famous for its golden pagodas. Visiting the famous pagodas in Yangon is the main Yangon Myanmar Point of Interest. Some of the famous pagodas are not just the religious sites, but also the heritage monuments in Yangon. You will witness how the locals perform religious proceedings and you can explore the traditions and culture of Myanmar. When you visit the pagodas, you need to avoid wearing shorts and showing a lot of skin. You must take off your shoes and socks to enter the pagodas as well. Shwedagon Pagoda is the main attraction of Yangon and it is also one of the most well-known pagodas in the world. The beauty and grandeur of the Shwedagon Pagoda amaze every visitor and the structure is 99 meters high. Since the pagoda is situated on top of a hill overlooking the city, you can see it from most places. Another famous pagoda that you must visit in Yangon is Sule Pagoda. Sule-Pagoda is located at the heart of the city and it is surrounded by many other attractions of the city. Another remarkable pagoda is Chaukhatgyi-Paya and there is a temple that houses one of Myanmar’s most adulated reclining-Buddha Statues. 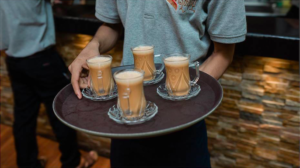 Myanmar has a unique tea shop culture and you can find a tea shop in almost every corner of the city. Usually, you can get most of the Burmese traditional dishes in the tea shops and delicious Burmese tea. The best time to visit a tea shop is in the morning for breakfast. 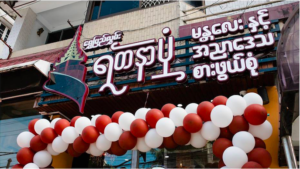 Then, you will be able to try famous Burmese Breakfast such as Mohinga, Ohn Noh Khow Suey (Burmese Traditional coconut noddle, read here for more information about Coconut Khow Suey), and many others. You can also observe and explore the tea shop culture of Myanmar. If your place is in the downtown or near the York street, Yadanapone Tea shop is one of the best places to try Burmese breakfast before starting your day in Yangon. Since the traffic of Yangon is extremely terrible, it is better to go on foot for short distance travels. By randomly walking around the city, you will be able to explore interesting things in the neighborhoods. While walking around the city, you need to be careful because the city still doesn’t have a good traffic system. It is better to cross the road at the traffic light if you are crossing the busy main roads. You can also join the Yangon walking tour. 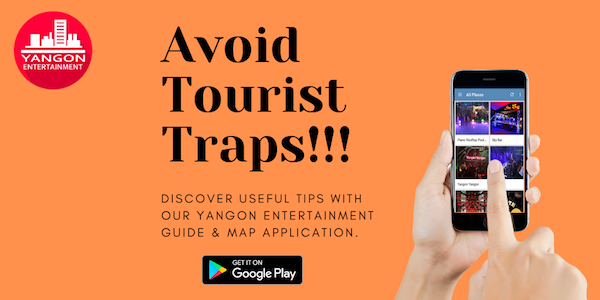 Most of the free tours will happen on weekend but there are also paid Yangon walking tour run by individual or tour companies. If you want to go on by your own, here are some interesting places to visit and see on your walking trip in Yangon downtown. 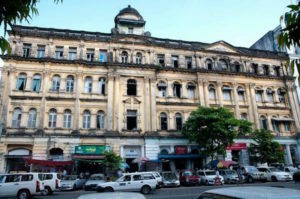 All these Yangon colonial buildings are located in downtown Yangon and can be reached on foot. 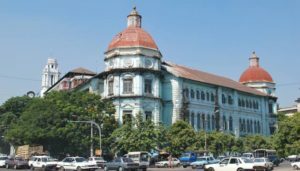 The beautiful St Mary’s Cathedral, the third biggest cathedral in Asia, the magnificent Secretariat Building, the port authority building, the old Armenian Church and old quarters in Indian and Chinatown are also the best places to visit to explore heritage buildings of Yangon. 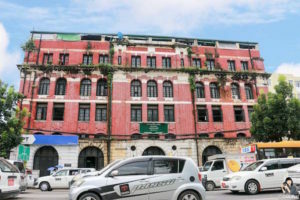 The famous Bogyoke Market aka Scott Market is one of the top Yangon Myanmar places of Interests. 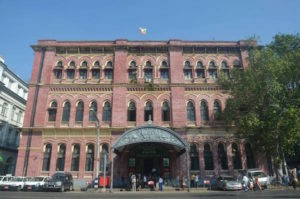 Bogyoke Market is located at the center of Yangon and there are more than 2,000 shops where you can buy local products. You will find the biggest selection of traditional handicrafts and souvenirs in the Bogyoke Market. The jade market section is the most popular section in this market, especially for Chinese tourists. You can get various kinds of fabrics from different areas of the country in this market. The price of the goods are in the mouth of the shopkeepers, therefore you need to negotiate the price. The colonial architecture of this century-old colorful bazaar and beautiful cobblestone streets are extremely fascinating as well. If you are interested in the art, you should visit the art galleries and you can find them in downtown. Through the amazing arts created by the local artists, you can learn more about the country and its culture. In the past, many art works are censored by the military government due to political interest. Now, there is no more censorship and many important art pieces are being presented to the public. Therefore, you should stop by the art galleries to check them out. This is one of the must place to visit on your trip to Myanmar and Yangon. Looking from outside, it is just a huge boring five-story building beside Pyay road. But when you go inside, you will be able to learn the histories and cultures of Myanmar since the stone age. The Museum is divided into age by age and sector by sector. It took at least 2 hours to look around even for the local. It is located at No. 66/74. Pyay Road. Dagon Township. Yangon. In the past, visitors were not allowed to take a photo inside the museum. But nowadays, you can bring your mobile phone and take a picture of most of the things, but you are still prohibited to take some items (it is labeled clearly). Do you wish to try the Burmese street food? Then, you should visit the street markets of Yangon to explore and fill your stomach with delicious food. If your stomach is quite sensitive, I would suggest you be careful with street foods. You can also purchase the fresh fruits in cheap price from the street markets. You should visit the night market on Strand Road, 19th street and Chinatown as well. The best time to go to those night markets is after 6:00 pm. The reconstructed Karaweik Palace which is located in the Kandawgyi Lake Garden is one of the most popular attractions of Yangon. Kandawgyi Lake Garden also hosts the Utopia Tower, aquarium and many restaurants. Kandawgyi Lake is also famous for being one of the best spots to see the sunset. From the sunset viewing deck of Kandawgyi Lake, you can see the Shwe Dagon Pagoda as well. 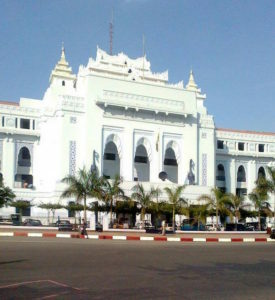 Karaweik Palace is one of the most famous landmarks in Myanmar. The Karaweik Palace is not just well-known for its unique architectural beauty. The palace also has a magnificent restaurant where the best royal cultural shows are hosted. Karaweik palace is the only place where you can discover authentic traditional performances. Therefore, you should give a visit to Karaweik palace and enjoy the fascinating performance while having a delicious buffet. Let’s explore the dark side of Yangon. Yangon nightlife is not very active compared to other southeast Asian countries and western countries. However, Yangon offers various kinds of entertainments including cultural shows, nightclubs, pubs, Karaoke bar, and Massage Parlors. Yangon nightlife is fun, friendly and diverse. However, finding the right place for you will be quite difficult without proper recommendation. Here is our recommendation for you to enjoy the best nightlife in Yangon. You can also read this related article on how to enjoy Yangon nightlife. Most of the rooftop bars in Yangon have the best view of Shwedagon Pagoda. Obviously, they are the fascinating Yangon Myanmar Point of Interests that you should not miss. So you can view the amazing golden pagoda standing gloriously at Yangon’s skyline from the rooftop bars. While sipping on your favorite drink, you can enjoy the spectacular views of Yangon city. You can also enjoy the beautiful sunset from the rooftop bars. There are many great rooftop bars in Yangon. If you prefer the luxurious rooftop bars, you should choose Penthouse, Yangon Yangon Bar, and Atlas Bar. If you don’t like crowded bars, you can go to Esperado, and Sapphire Lounger of Alfa hotel. Clubbing is also another option for having a crazy fun night in Yangon during your visit. The clubs are piled-up with beautiful girls and it is quite difficult to distinguish between the “working-girls” and other girls. But once you approach them, you can definitely find out if the girl is a working-girl or not. Most of the time, the “working girls” will approach you first. Among the nightclubs in Yangon, Pioneer Club, The One Entertainment Club, Muse, Fuse, and Emperor Clubs are the best. After walking around the city the whole day, you might be looking for a good Massage place for relaxing time. There are many famous massage-spas including Yangon Sanctuary Spa, Inya Day Spa, Sapel Traditional Burmese Foot spa and many others. There are also many happy ending massage parlors around the city. You can read more articles related to massage in Yangon in this blog.